Get an accurate picture of your art business by staying on top of your income and expenses with Artwork Archive. 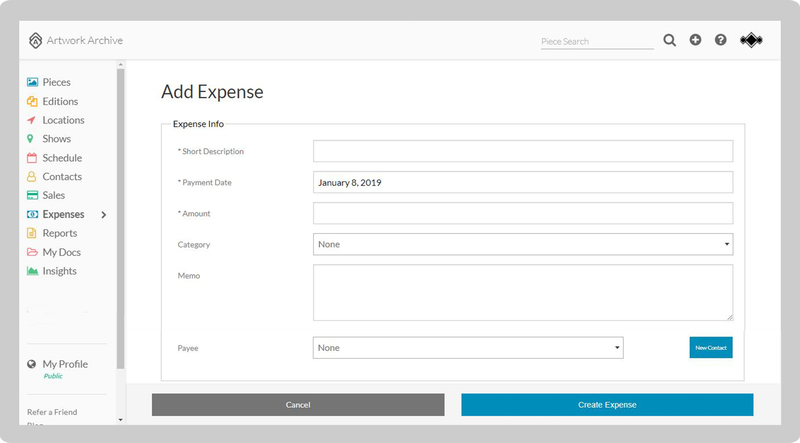 Tie your expense records to a client within the database, gain insight into how much you are spending in certain categories, and get one-click expense reports with the expense tracking tool. Expense tracking is available on Professional & Master accounts. Click on Expenses in the left-hand menu. Click on New next to the plus symbol in the top menu under Expenses. Type in a Short Description, Amount, and Memo. Select the expense's Payment Date from the drop-down menu. From the Category drop-down menu, select the type of expense. If desired, record who the payment was for by selecting a current Contact from the drop-down menu or by clicking New Contact and adding a First and Last Name of a new client. Then click the blue Create Expense button at the bottom to save your expense. Click on Expenses in the left-hand menu. On the right-hand side of the expense you'd like to edit, click on Edit in blue. Or, click on the blue title of the expense under Description and click Edit in the top-hand menu of the individual expense. After you have finished editing, click the blue Update Expense button at the bottom. If you'd like to attach a copy of the receipt or another important document pertaining to an expense, click on Expenses in the left-hand menu. Click on the blue title of the expense under Description or select View in blue on the right-hand side of the expense. Next to Additional Files at the bottom, select Add File. Click on the Choose File button to upload a file, then enter a file name and any notes you'd like to add. Click the blue Save File button. Click on Expenses in the left-hand menu. On the right-hand side of the expense you'd like to delete, click on Delete in blue. Or, click on the blue title of the expense under Description and click Edit in the top-hand menu of the individual expense. Then click the red button with the trash symbol at the bottom to delete. Click on Expenses in the left-hand menu to view all of your added expenses. To view a specific expense, click on the blue title of the expense under Description or select View in blue on the right-hand side of the expense. To view only certain expenses, click on Expenses in the left-hand menu. Click on Filter in the top menu under Expenses. From the drop-down menu, you can filter expenses based on Category, Payee, and Start Date to End Date. To view your expenses in a certain order, click on Expenses in the left-hand menu. Click on Sort in the top right-hand corner to see. From the drop-down menu, choose to sort by Date (new or old), Description (a-z or z-a), or Amount (high or low). To search for a specific expense, click on Expenses in the left-hand menu. In the search bar at the top, type in the name or description of the expense.